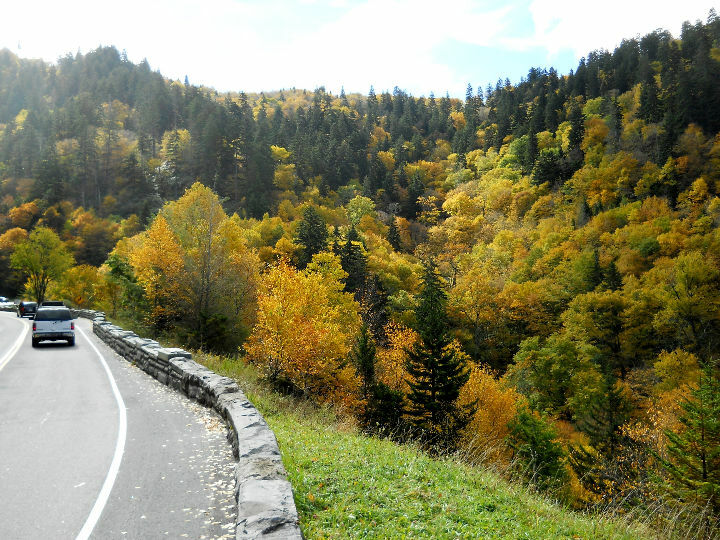 This RV trip took us about 1500 miles away from the Houston area at a beautiful time of the year in the Mountains of TN and NC. 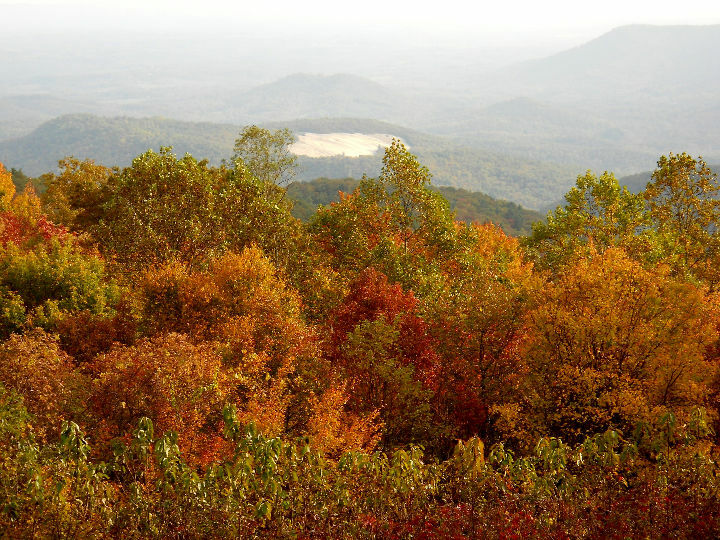 We had not planned it to coincide with Fall colors, but we were fortunate and arrived in NC just in time for the peak colors. 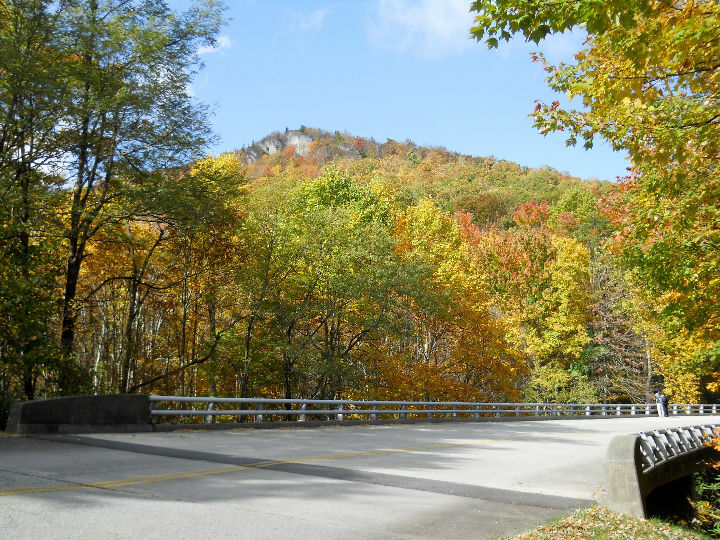 We had to adjust some of our plans at the start because the US Government was shut down and our plan to camp in the Great Smokey Mountains National Park had to be bypassed. As it turned out, since the road through the park was still open, we didn't miss the scenery, and even got to see a black bear in a tree near the road, eating some type of wild fruit from a vine. The weather was nice most of the time and when it was marginal, we were able to adjust to it with no difficulty. 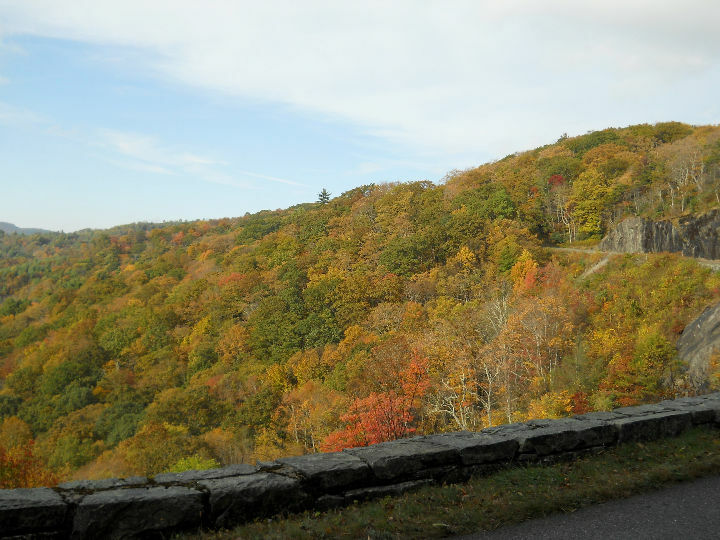 We saw spectacular scenery along the Blue Ridge Parkway in NC. We made it all the way to the Outer Banks and the Atlantic Ocean. On the return home, we stopped in Atlanta to see a few sites. We hope you enjoy our story and a selection of our many photos. [Friday] October 11th, we arose at 4:30 AM, after sleeping in the trailer, and made a quick departure from the Houston area to beat the traffic. We left our home at 5 AM and sailed through Houston on US-59, and by 7 AM, we stopped in Livingston, TX, for breakfast in the HEB parking lot. We continued on US-59 to Carthage, TX, where we took US-79 to Shreveport, LA. At Shreveport, we took IH-20 to Clinton, MS, where we spent the night at Springridge RV Park, site #33. Lawson's sister and brother-in-law, as well as his niece's family came over to our campsite for some pizza for supper as we enjoyed visiting with them. [Saturday] We got up at 6 AM and after breakfast, we left Clinton at 7 AM on I-20 East. At Meridian, MS, we picked up IH-59 North to Chattanooga, TN. 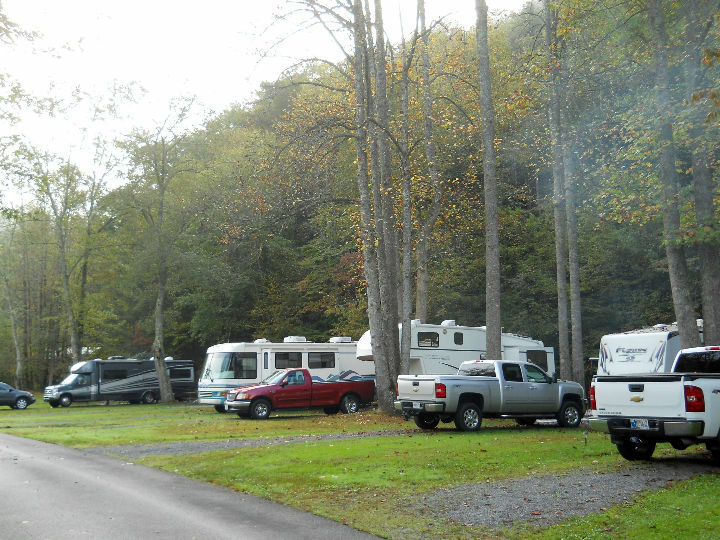 We camped the night at Lookout Mountain Chattanooga South KOA RV Park in Ringgold, GA. The first two days of our trip have involved traveling around 400 miles each day. This is a lot more than we usually do, but these days were driving 100% on freeways, so we moved along at 60 to 65 miles per hour fairly consistently. 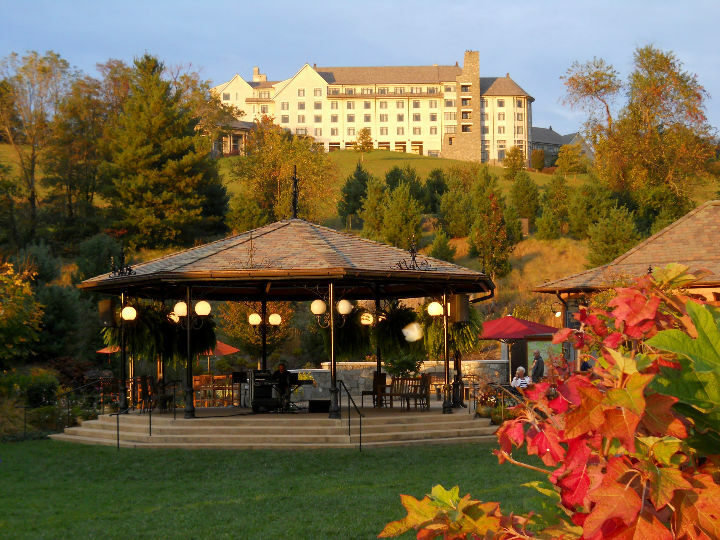 [Sunday] We decided to go to Lookout Mountain before we drove to Gatlinburg, TN. After breakfast we took the trailer with us to Rock City. 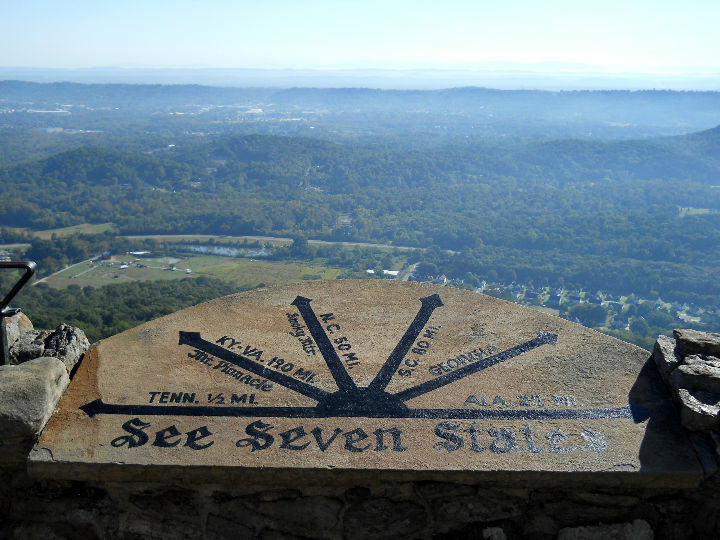 We walked the trails and saw the view of 7 states from the top. There was still some of the morning fog left on the distant mountains. Otherwise, the weather was perfect. 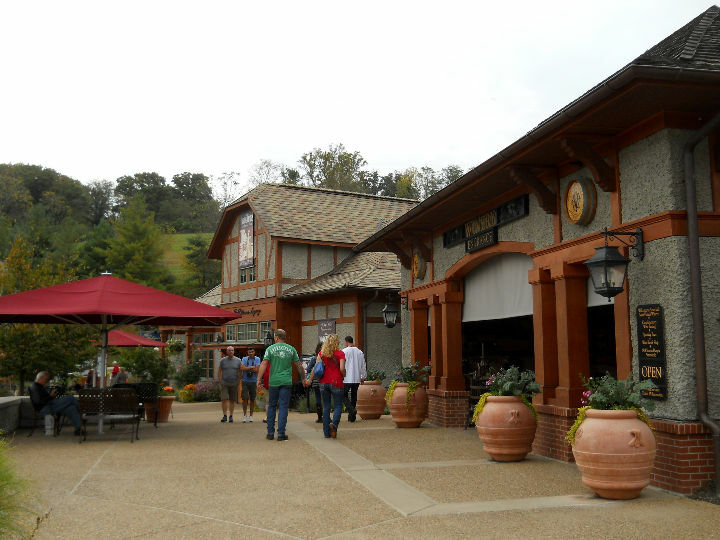 Afterwards, we drove to Ruby Falls and ate a quick lunch in their cafe before we took the guided tour of the cave. 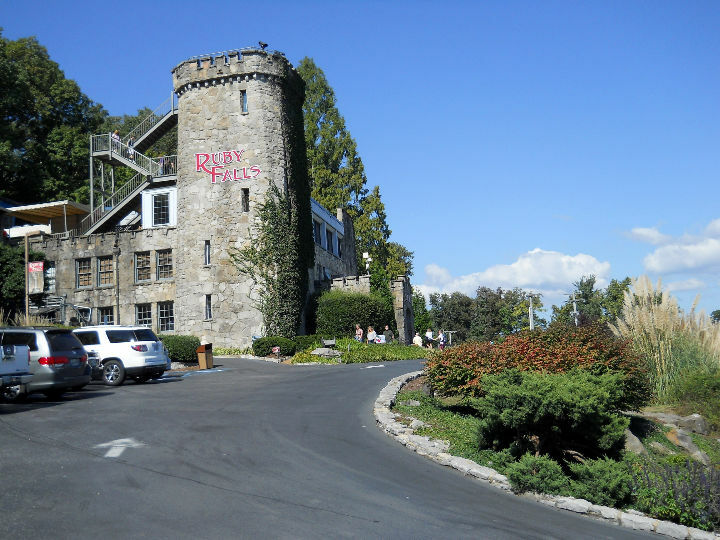 We walked the 1-mile round-trip to Ruby Falls. 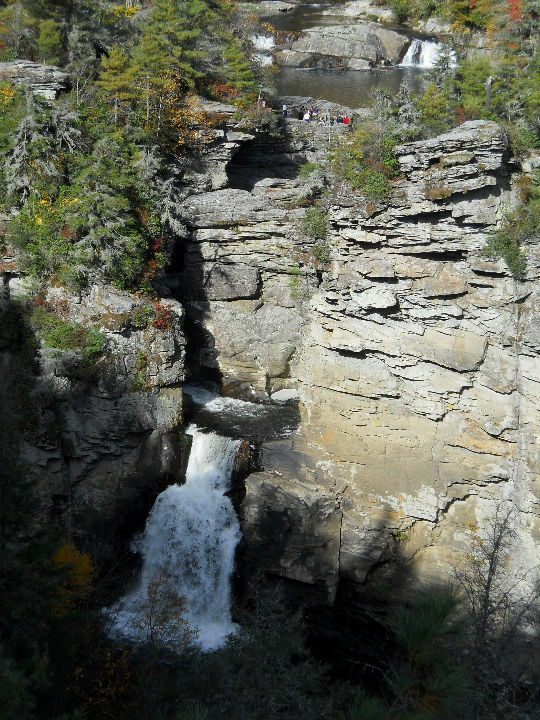 The falls is quite a site so deep in the ground. 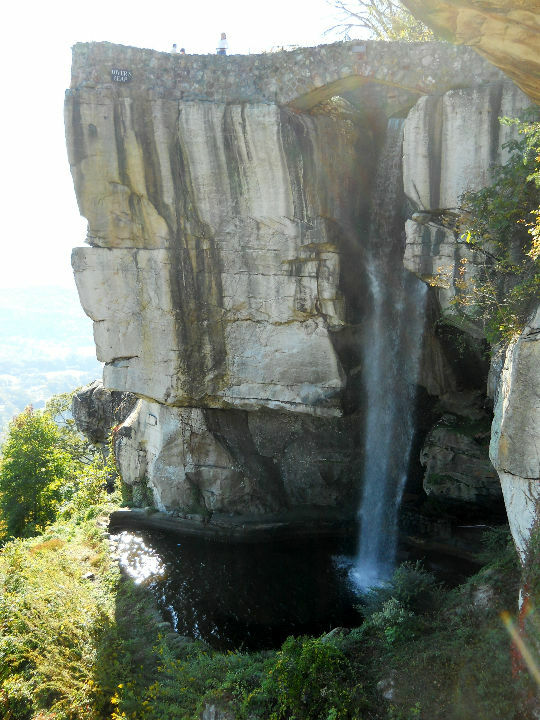 < < < Lookout Mountain TN. 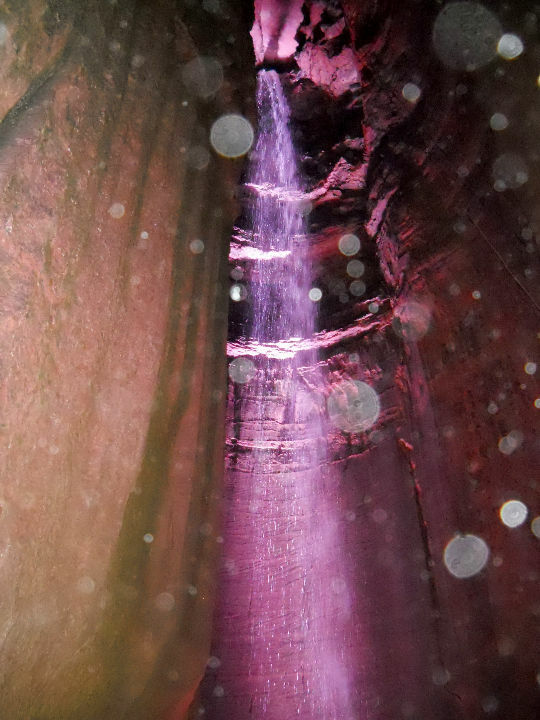 < < Ruby Falls TN. Click on the small photos to enlarge them. 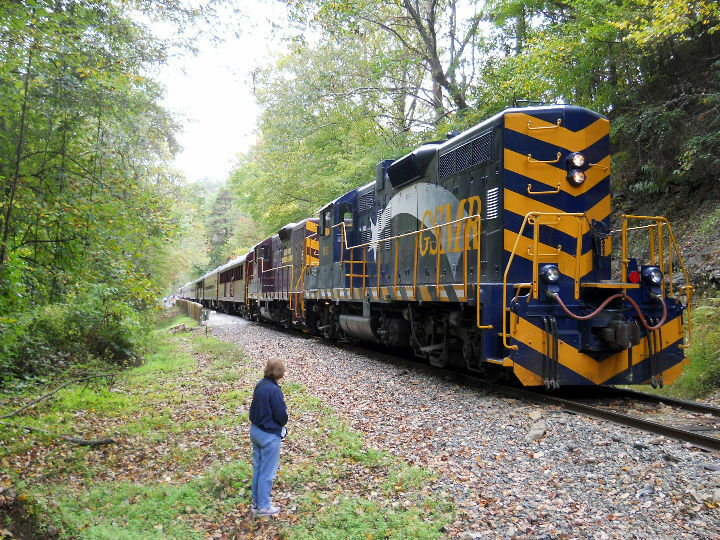 We didn't have time to take the Incline Railroad to the top of Lookout Mountain, even though we purchased a ticket because we needed to be in Gatlinburg by 7 PM to make our RV park reservations. We took the almost 3-hour drive from Chattanooga to Gatlinburg and arrived about 6:30 PM, in time for our campsite reservation. < Our campsite in Gatlinburg. [Monday] Today we drove through the Great Smokey Mts. 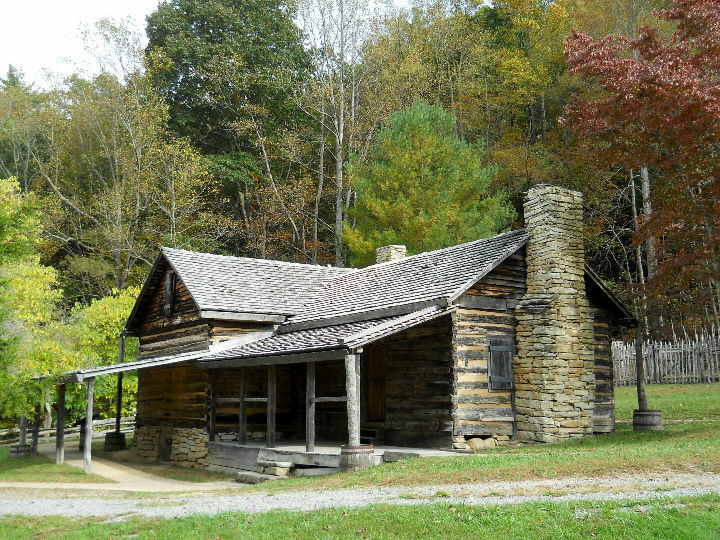 National Park (GSMNP), even though the park was closed due to the government shutdown. The leaves and views were pretty good and the pullovers were mostly open. 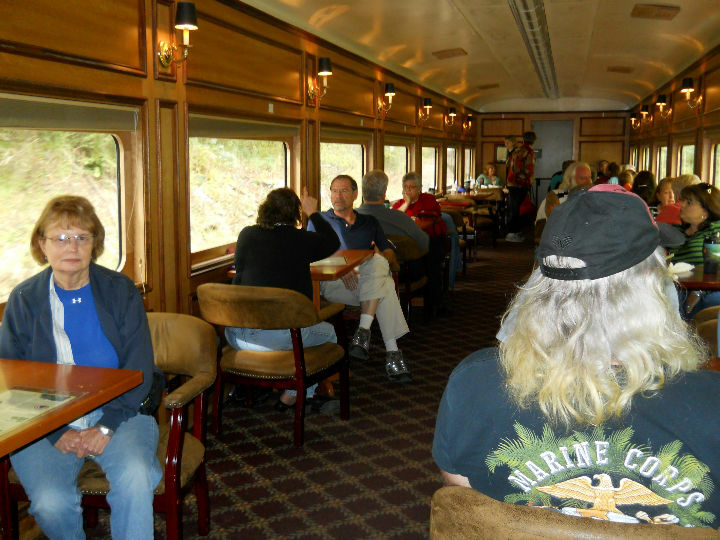 We drove on to Bryson City, NC, where we rode the 2 PM Great Smokey Mountain Railroad train. On board we enjoyed a very hearty salmon dinner with an awesome chocolate cake dessert. We got back from our train ride at 6:30 PM and then drove back through GSMNP to our RV park in Gatlinburg. 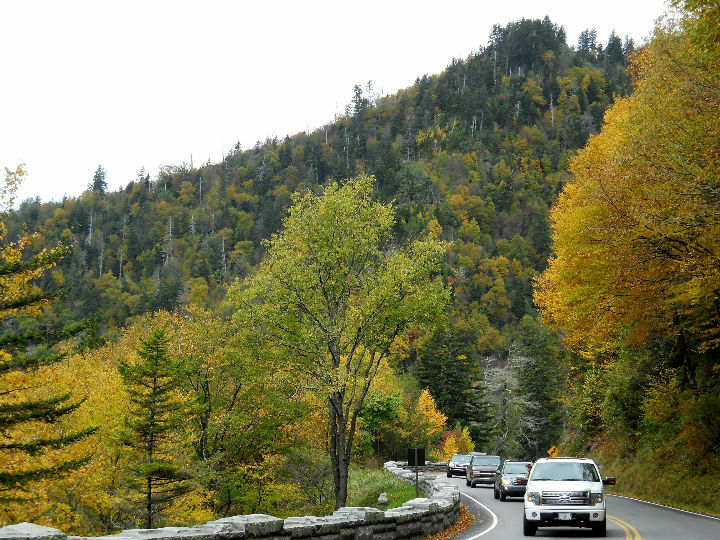 < < < < Views along US-441 through the GSMNP. < < < Riding the GSMR train. 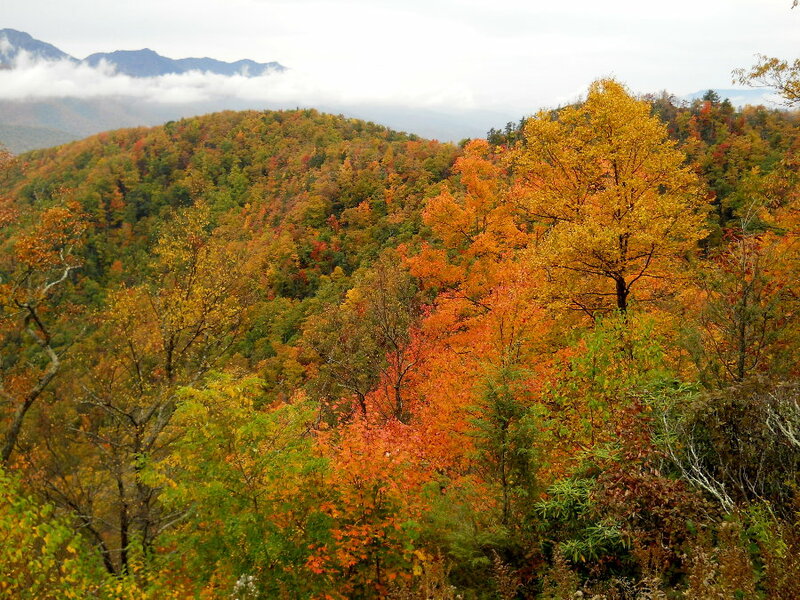 [Tuesday] Today we left Gatlinburg and went up US-321 to IH-40, then East to Asheville, NC. 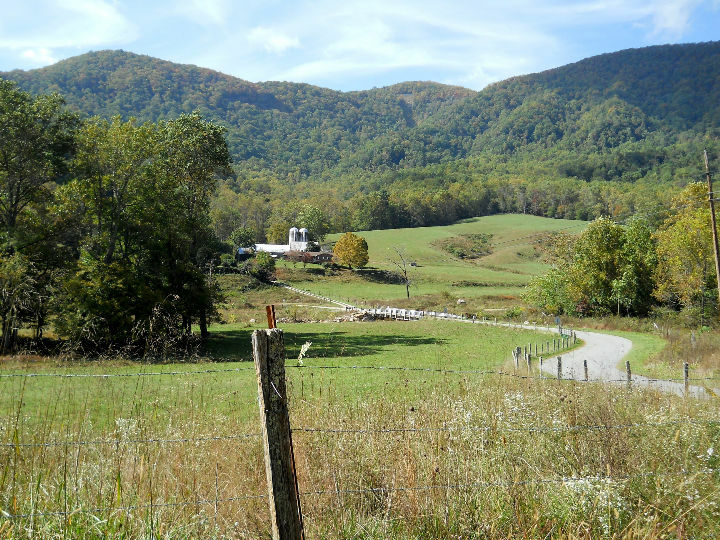 We camped at Mama Gertie's Hideaway Campground in Swannanoa, just East of Asheville. 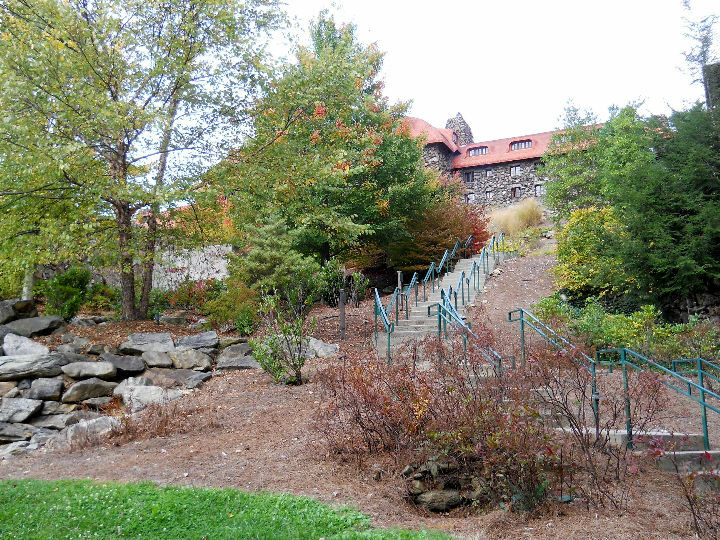 It is a nice park but on a very steep hill. Who would have imagined an RV park here? After lunch at the trailer, we went to the Asheville Visitor Center and took the Gray Line Trolley tour of Asheville. 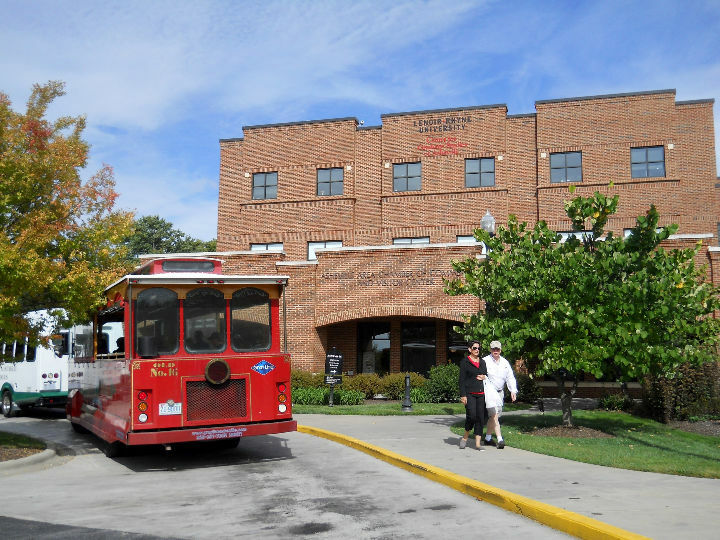 The driver was very knowledgeable on the city's history and we saw many of the historic districts. 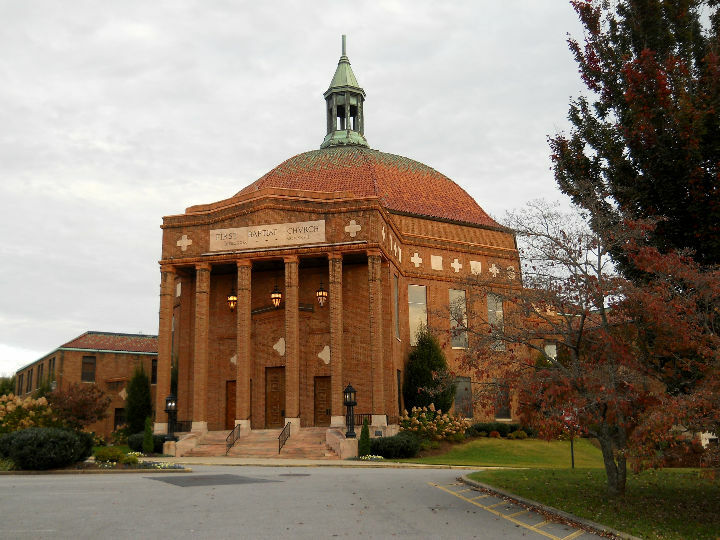 After the tour was over, we drove back to the historic Grove Park Inn and the First Baptist Church to take a closer look than we got on the tour. < Asheville Visitor Center. 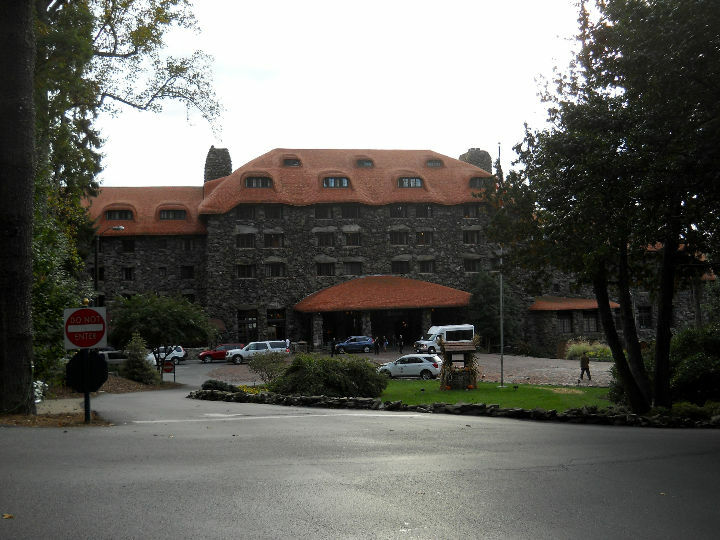 < < Historic Grove Park Inn. < First Baptist Church, Asheville NC. [Wednesday] We spent the entire day at the Biltmore. In the morning we toured the house. 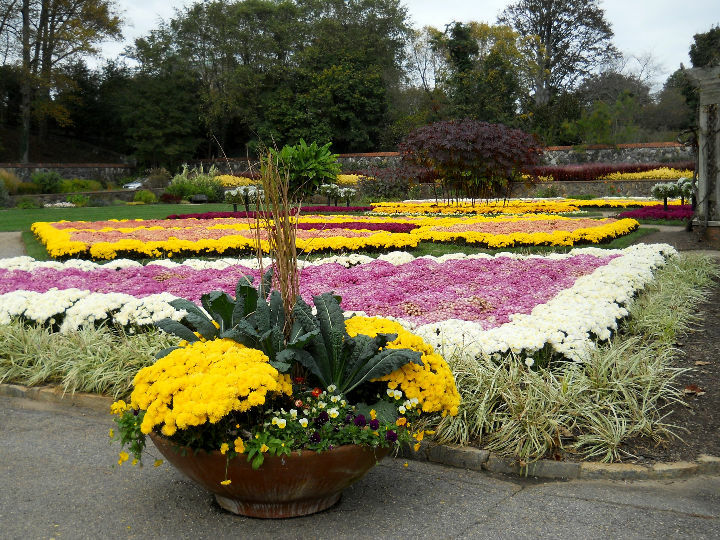 After lunch we toured the gardens. Afterwards, we drove to the Antler Hill Village & Winery and tasted a few of the wines and walked through the village and farm. The weather was good and cool - just about perfect for this activity. 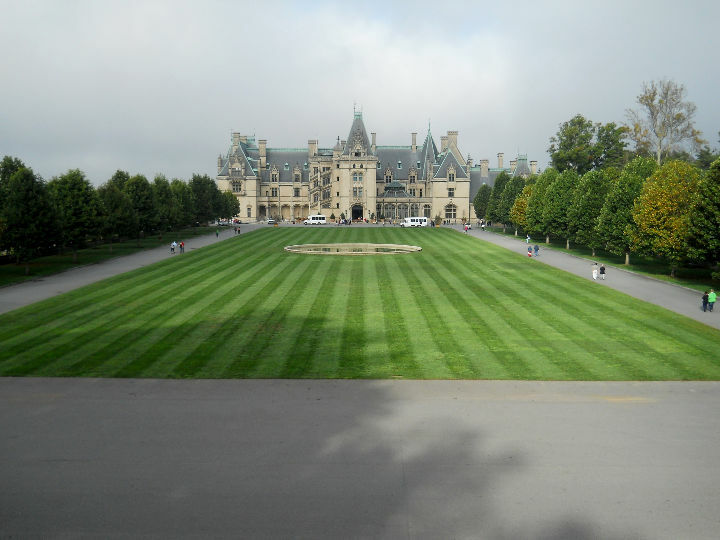 < < < < Biltmore house and gardens. < < Antler Hill Village. 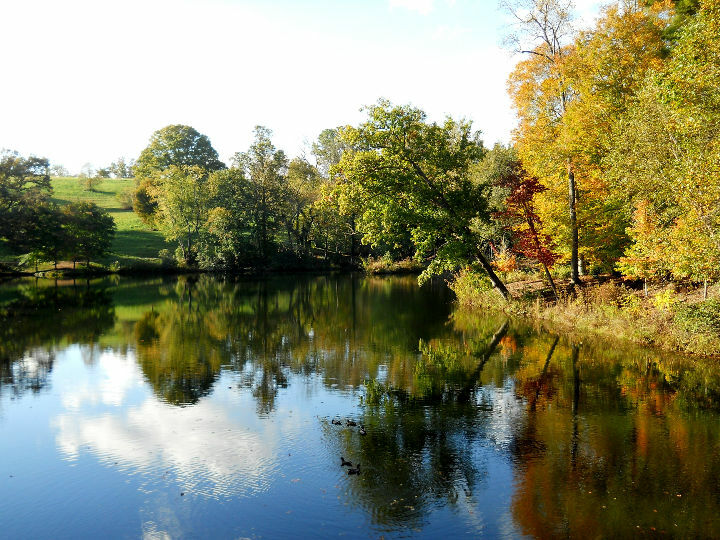 < Lake on Biltmore estate. [Thursday] Today, we had to leave Mama Gertie's because we couldn't get a reservation starting today. 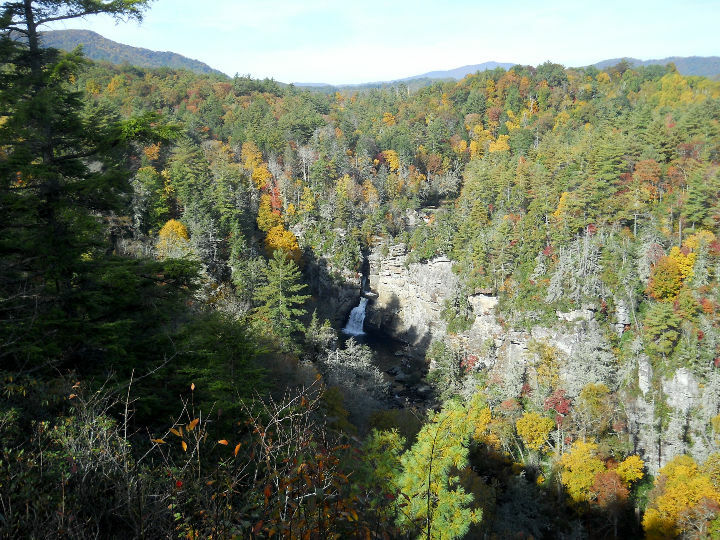 In the morning it was raining, and we drove North on IH-40, then US-221 to near Linville Falls, NC, to Linville Falls Trailer Lodge & Campground. 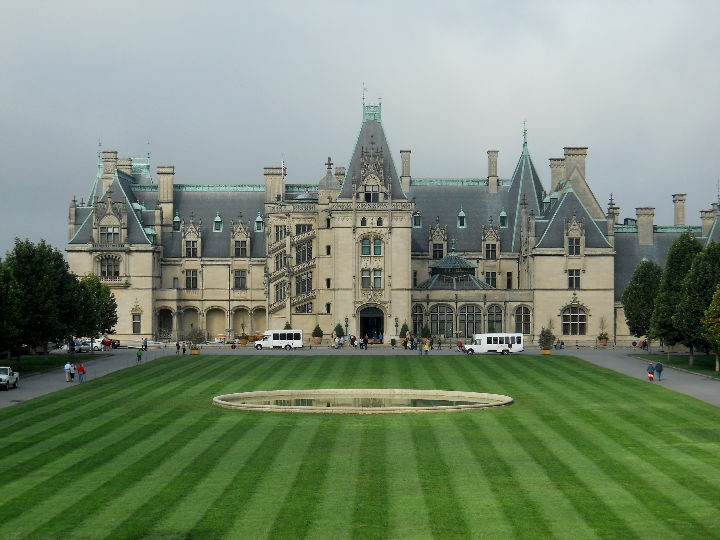 After we got the trailer in our assigned site, we drove about 50 miles back to Asheville and the Biltmore to take the 3 PM Butler's Tour of the house. This guided tour takes you to the working parts of the house and is very informative on how the house was run by the workers during the time the Vanderbilts lived in it. 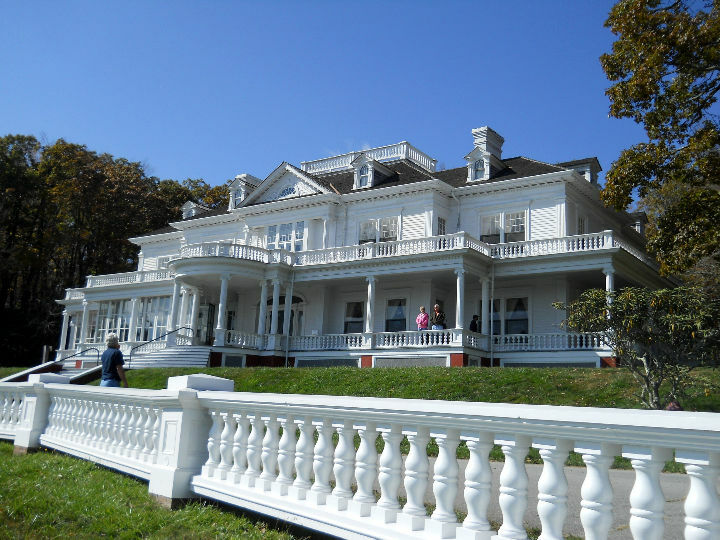 After the tour and a extremely large ice cream cone, we drove to the Antler Hill Village and toured the Legends Museum, which covers the life of the Vanderbilts. 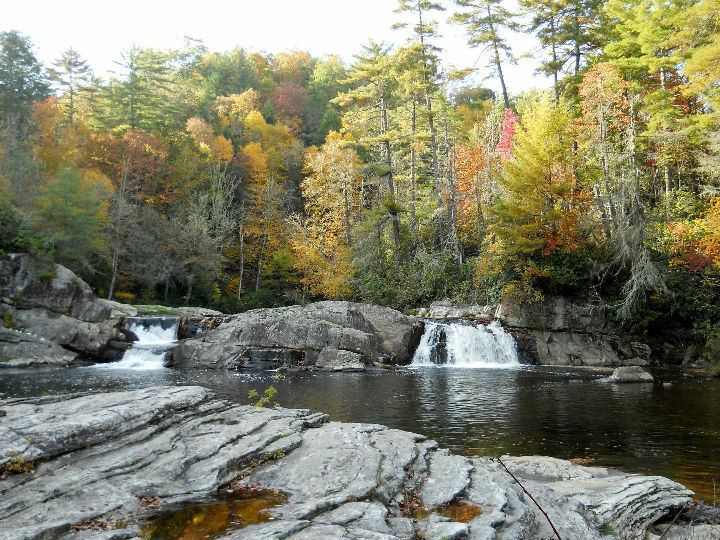 < Our campsite at Linville Falls. [Friday] In the morning we took the short drive on the Blue Ridge Parkway (BRP) to Linville Falls. 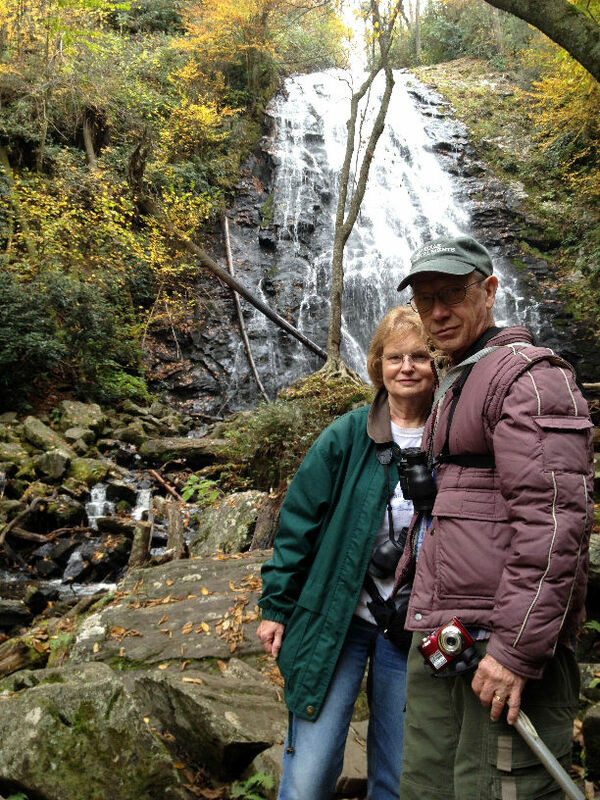 We walked the Dugger's Creek Loop Trail past a small falls to start. 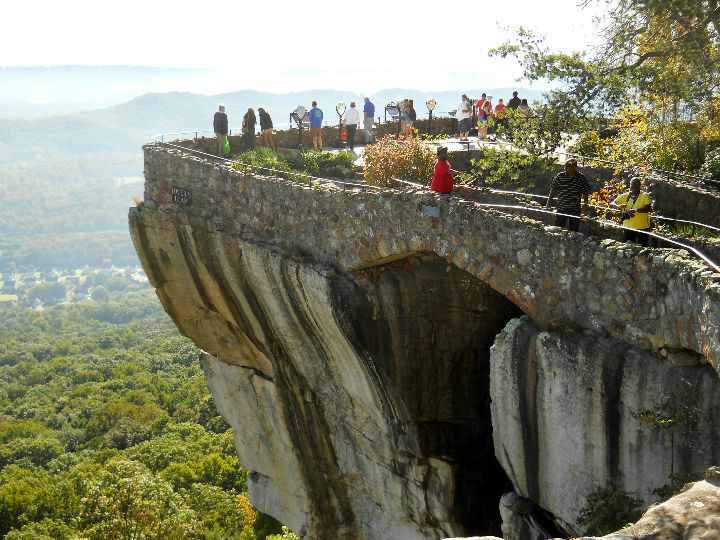 Then we walked the Erwin's View Trail and stopped at the three observation points on it to view the falls. The falls and the Fall colors here were very good. 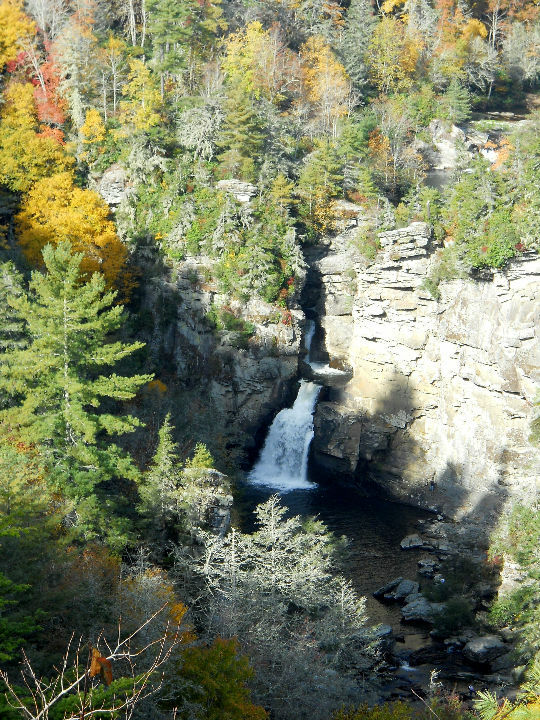 < < < < Upper and lower Linville Falls. After retuning to the trailer for lunch, we drove to the Wisemans View observation point that the park owner told us was his favorite spot. 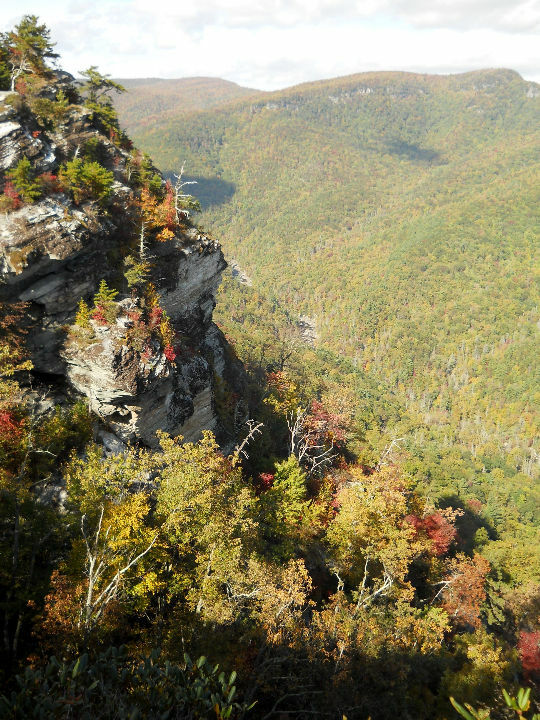 The views were excellent, overlooking the Linville Gorge. < Farm on road to Wisemans View. < < < Wisemans View. 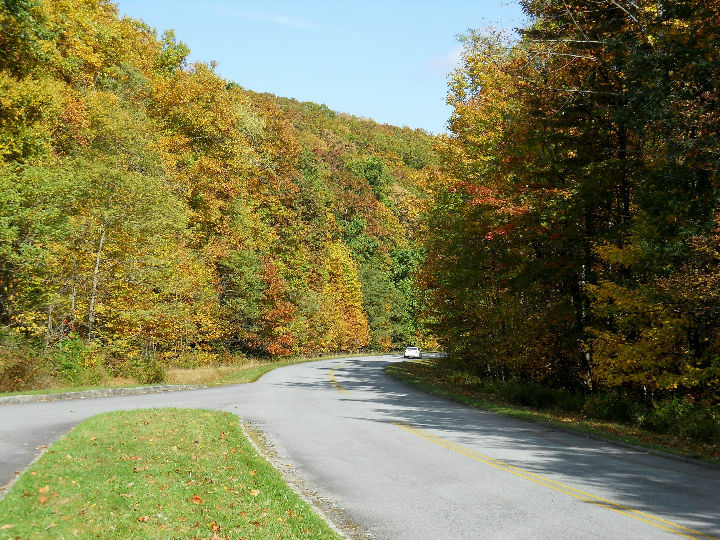 [Saturday] We drove south on the BRP to Mount Mitchell State Park, stopping along the way at a few of the lookouts. But since it was very cloudy and threatening to rain, the views were not as spectacular as in the days before. 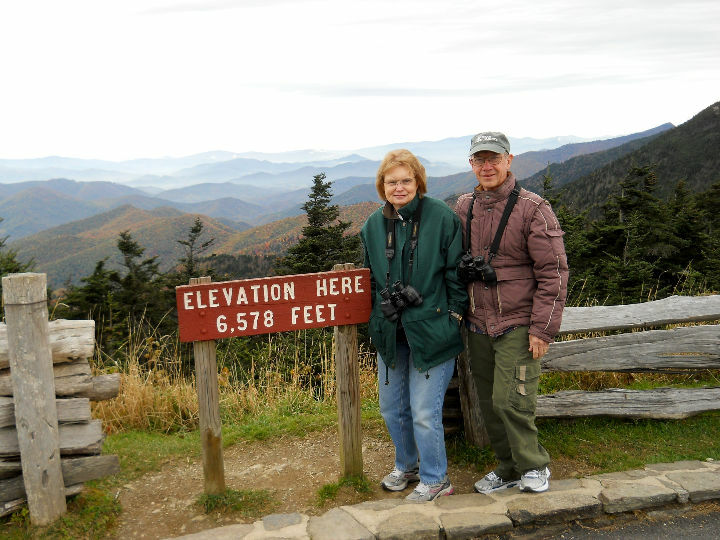 At Mount Mitchell, we drove to the top and took the short walk up to the top. It was 42 degrees and a stiff breeze, so it was pretty uncomfortable, even with our heavy coats, but the view was worth it. On the way back to the parking lot, we stopped at the convenient snack shop run by the Park Service and got a very good Cappuccino that just hit the spot. 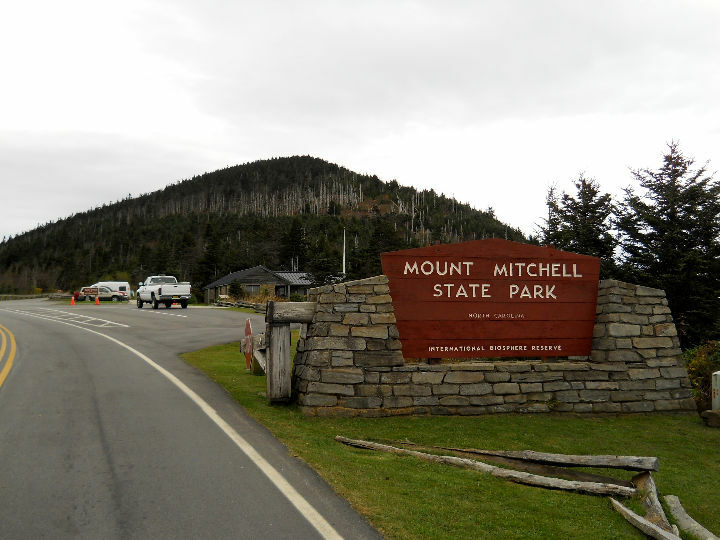 < < Mount Mitchell State Park. 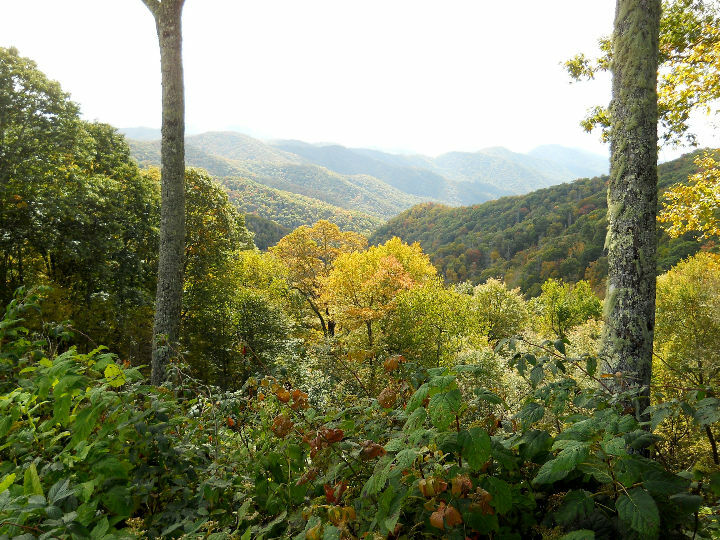 It was about 11:30 AM when we left Mount Mitchell, so as we traveled north on the BRP we stopped at one of the overlooks and ate our lunch in the warmth of the truck. 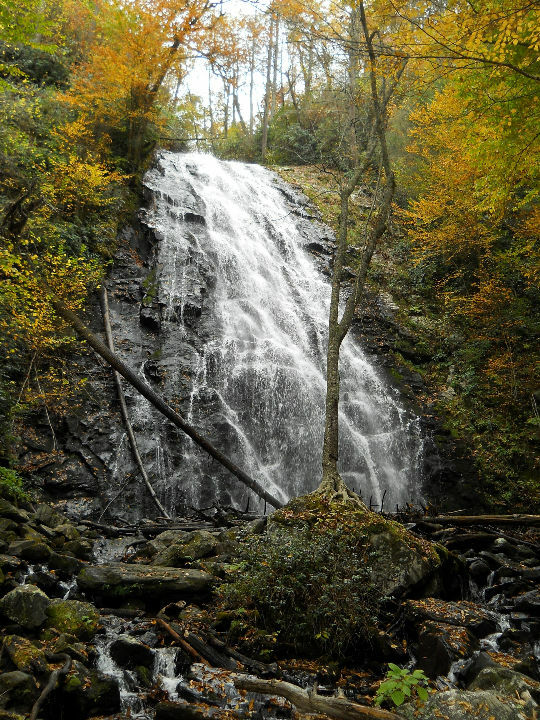 We then continued north and stopped at Crabtree Falls. We took the 0.9 mile strenuous trail down the mountainside to the falls. The falls is one of the best we have ever seen, discounting Niagara Falls, of course. On the way back up from the falls, it started to drizzle rain on us, but had stopped by the time we got to the truck. On the way back home, we stopped at all the overslooks on the BRP. 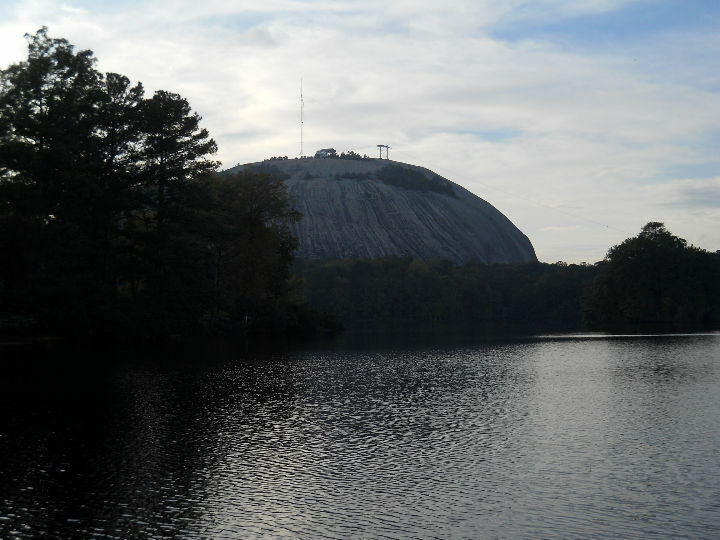 [Sunday] Today we left this RV park and traveled North on US-221 and NC-18 to Stone Mountain State Park. 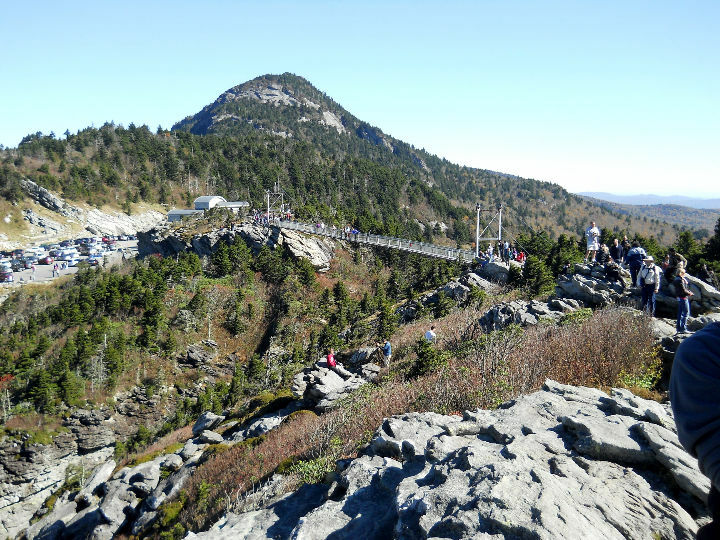 On the way, we stopped at Grandfather Mountain and after dropping the trailer at the entrance, we took the winding and steep road all the way to the top. 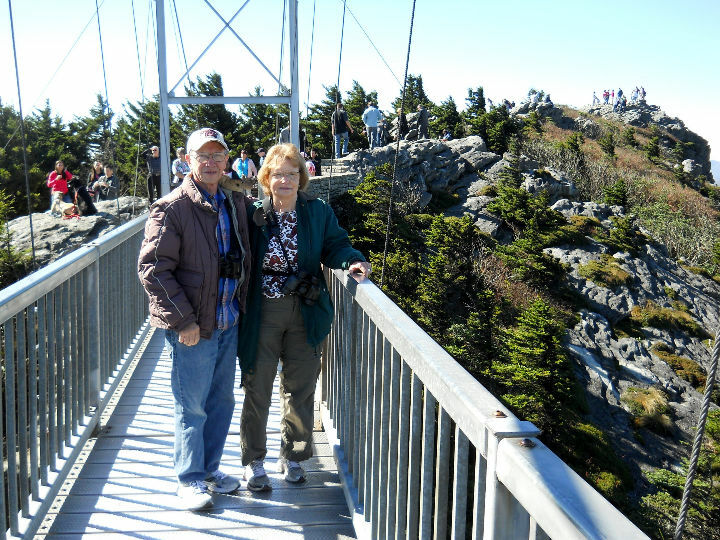 At the top we walked out on the "mile high swinging bridge". 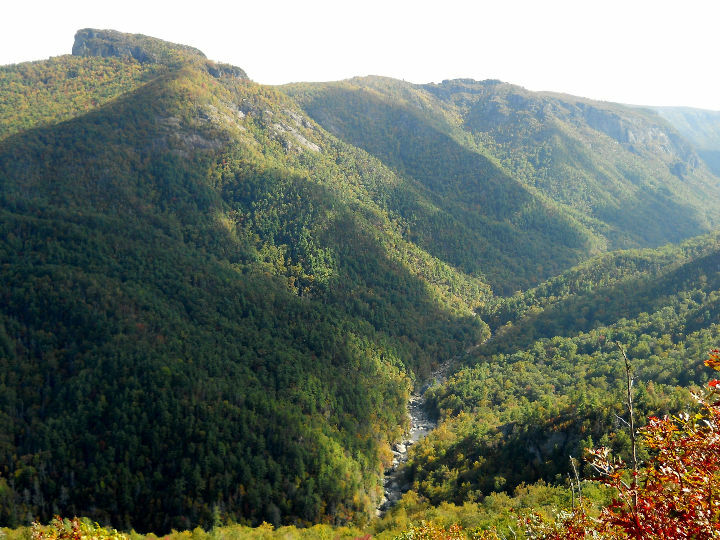 It is a mile above sea level and about 80 feet from the valley below. The view is very good from the top, as you would expect. 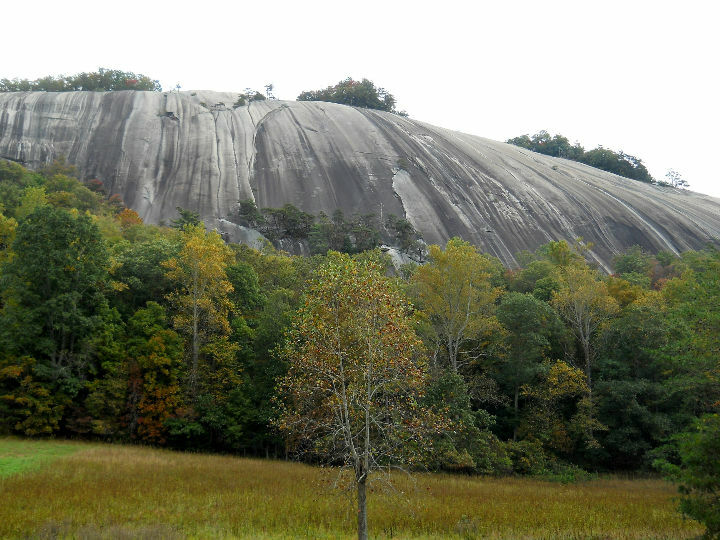 We left the mountain after eating lunch in the trailer and went on up to Stone Mountain SP, where we camped in site #58. [Monday] October 21st, we drove south all the way to Boone and then got on the BRP and headed further south to get to the best colors. 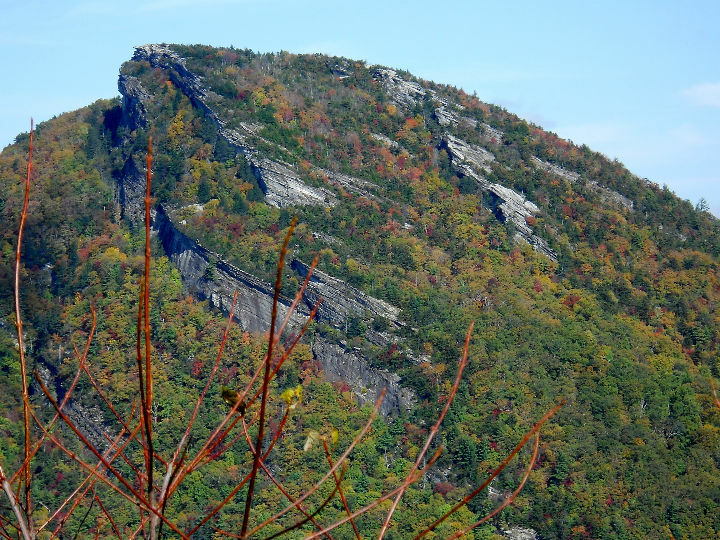 We drove all the way to Grandfather Mountain by lunchtime. We stopped at an old BBQ place and had lunch. We then started back north on the BRP toward Stone Mountain SP. 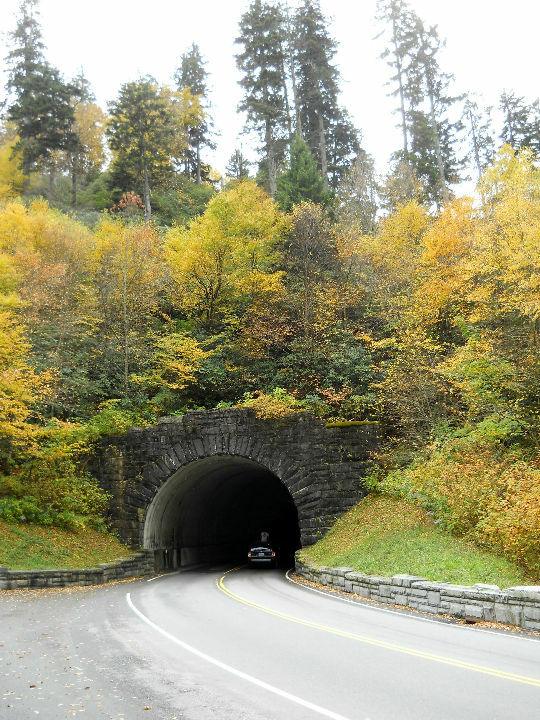 We saw lots of good fall color and got many photos along the way. We stopped at the Moses H. Cone Memorial Park Craft Center and Kay bought some nice NC craft items. They had lots of unique and innovative craft items in the old Cone homestead. We arrived back at Stone Mountain SP about 5:30 PM. A full day on the BRP, and our last for this trip. The leaves were awesome! < < <Fall colors. < Craft Center. 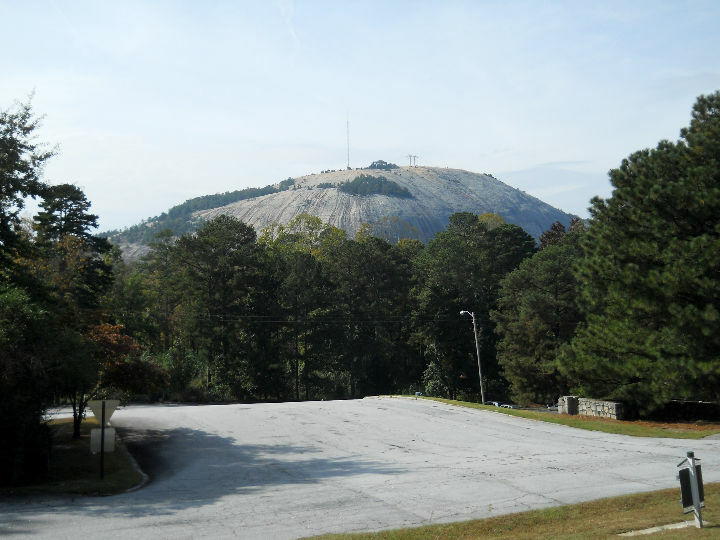 [Tuesday] In the morning after breakfast, we drove to the Cedar Rock trailhead in the park and walked the Cedar Rock trail to the the overview of Stone Mountain. On the way back to the parking lot, we walked through the old Hutchinson homestead. 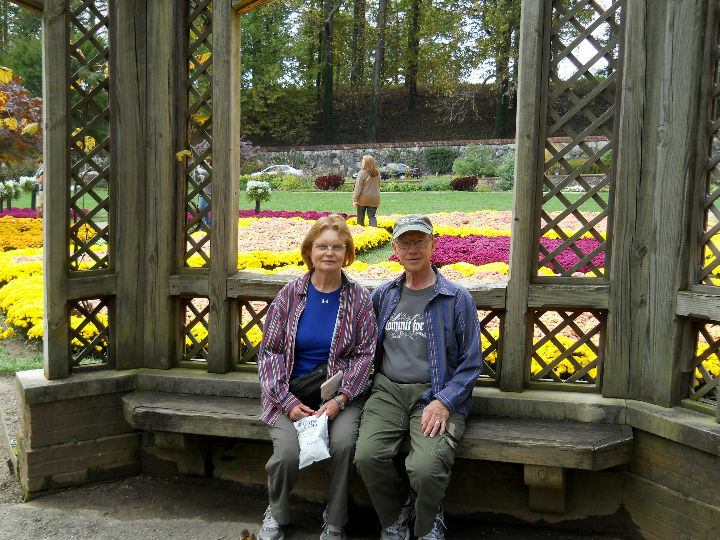 After lunch, we drove east on US-21, IH-40 and US-64 highways to spend the night in Williamston, NC, at Pierce RV Park. < < Stone Mountain. 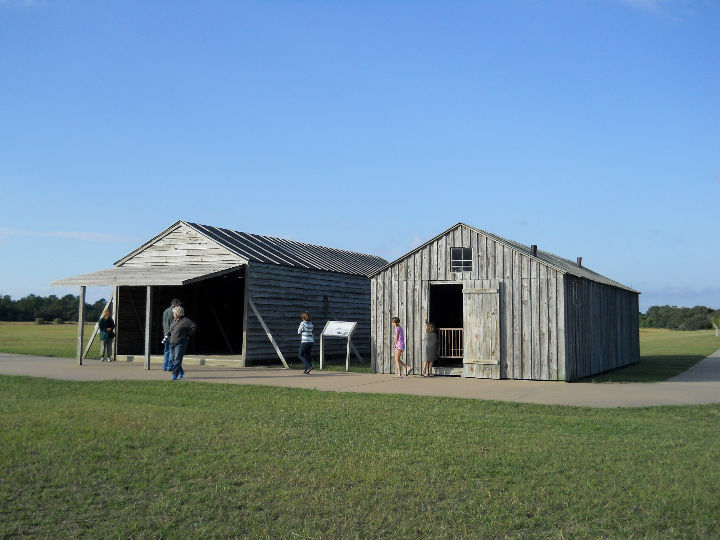 < Hutchinson Homestead. [Wednesday] Today we drove to Kitty Hawk on the Outer Banks of North Carolina (OBX). We arrived at noon, and after lunch we drove over to the Wright Museum and spent most of the afternoon there. Afterwards, we checked out the beach and drove along the beach road and saw some of the many rental homes along the way. It seems that every one of the thousands of homes on the OBX is for rent. 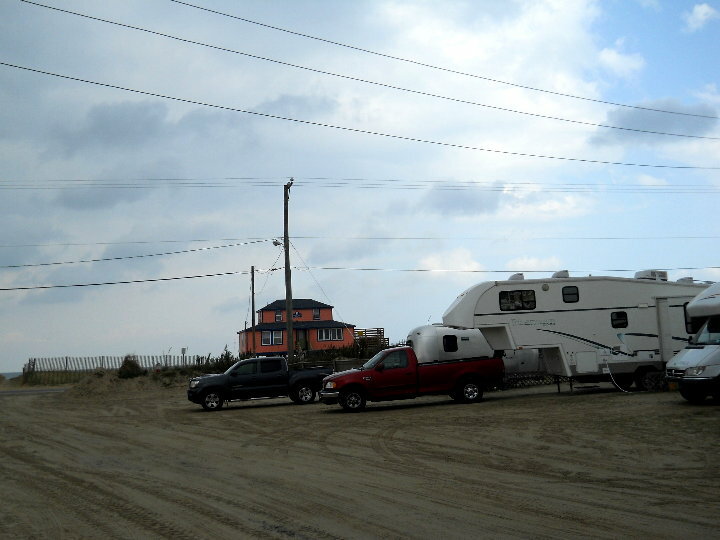 < Our RV site next to the Atlantic. 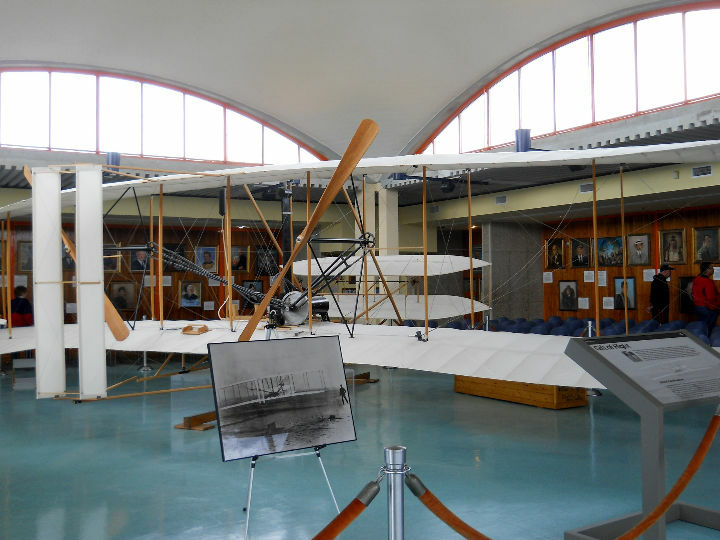 < < < Wright Brothers Museum. 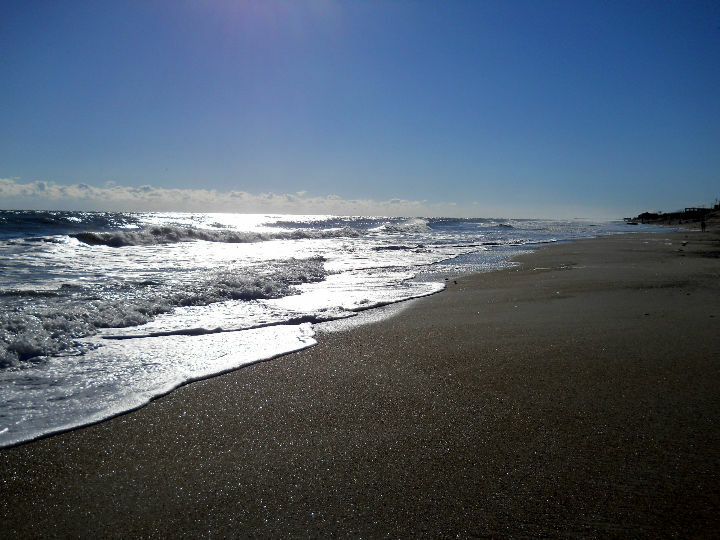 < The Atlantic Ocean. 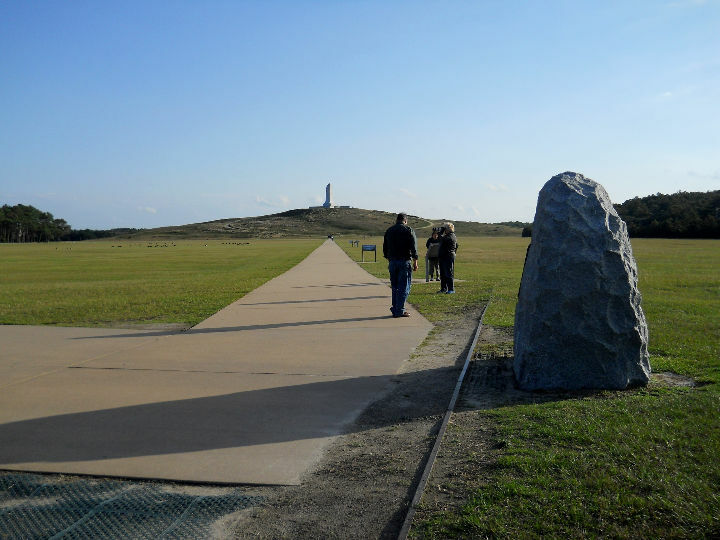 [Thursday] Today we drove south along the islands on NC-12 from Kitty Hawk to Ocracoke. 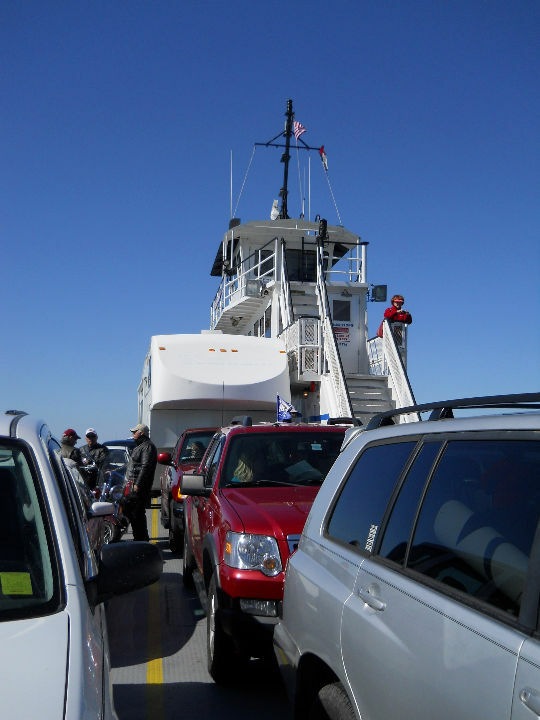 On the way we had to catch a 40 minute NC DOT free ferry boat to complete the trip. 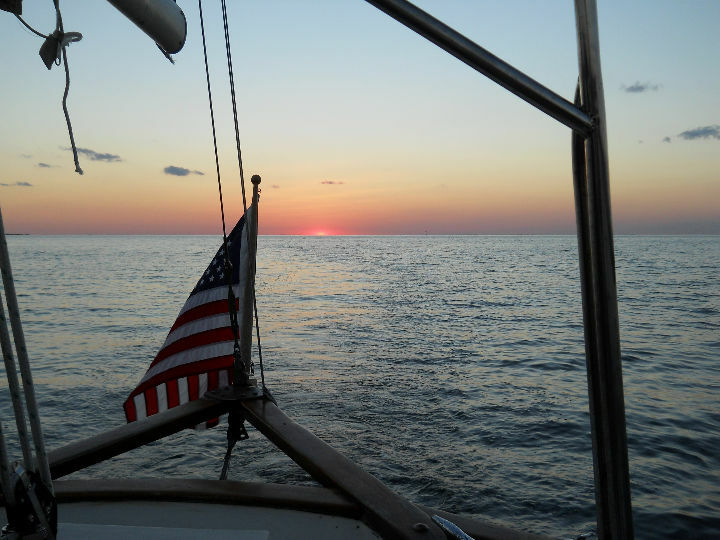 After we arrived and checked into the Beachcomber Campground, we took a 1 1/2 hour sunset cruise on the Schooner Windfall II in Pamlico Sound. It was a nice cruise and we were the only passengers today. Afterwards, we enjoyed a seafood dinner at Cafe Atlantic in Ocracoke. 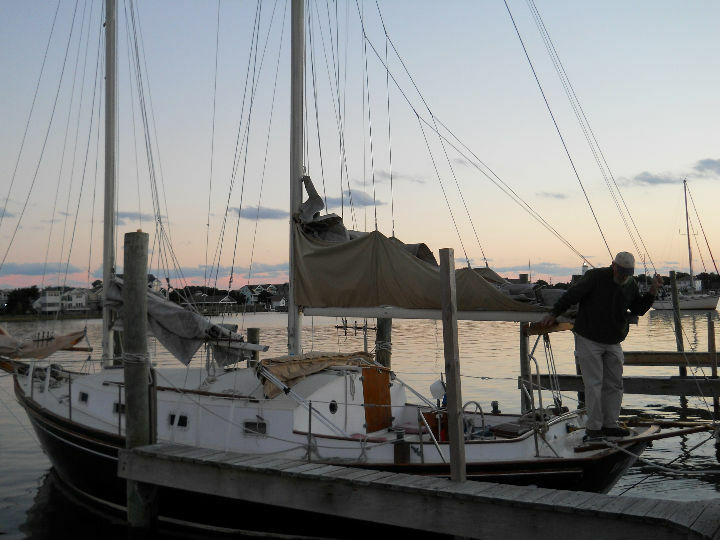 < < Schooner Windfall II. [Friday] This morning, after breakfast, we drove over to the Ocracoke Lighthouse. The lighthouse is closed for climbing, but is the second oldest lighthouse on the US East coast. Afterwards, we took the trailer and boarded the Cedar Island Ferry for the 2 hour and 15 minute ferry ride, which cost $30 for our combination. We arrived on Cedar Island about 12:30 PM. After exiting the ferry, we stopped for lunch just outside the ferry. 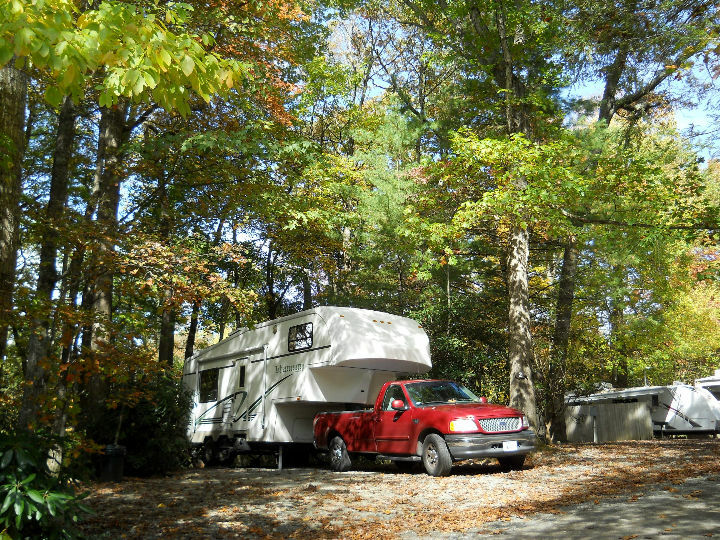 We then drove on NC-12, US-70, NC-24 and US-17 to Wilmington, where we checked in at the Wilmington KOA Campground. After doing laundry in the campground we enjoyed dinner in the trailer. 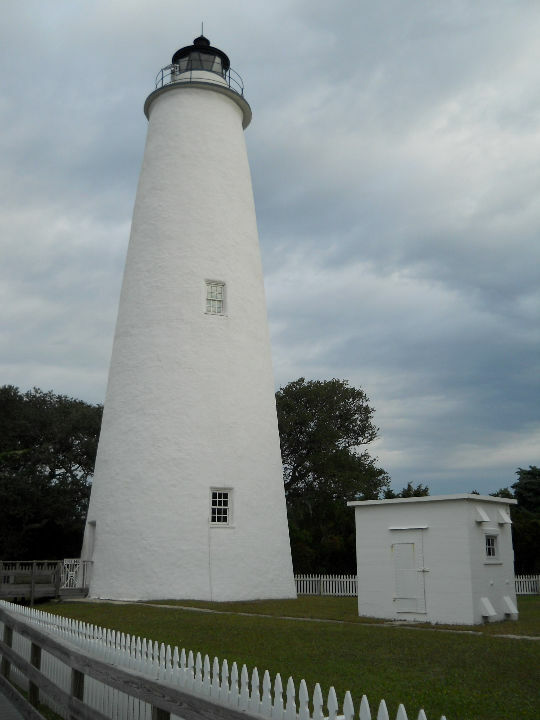 < Ocracoke Lighthouse. 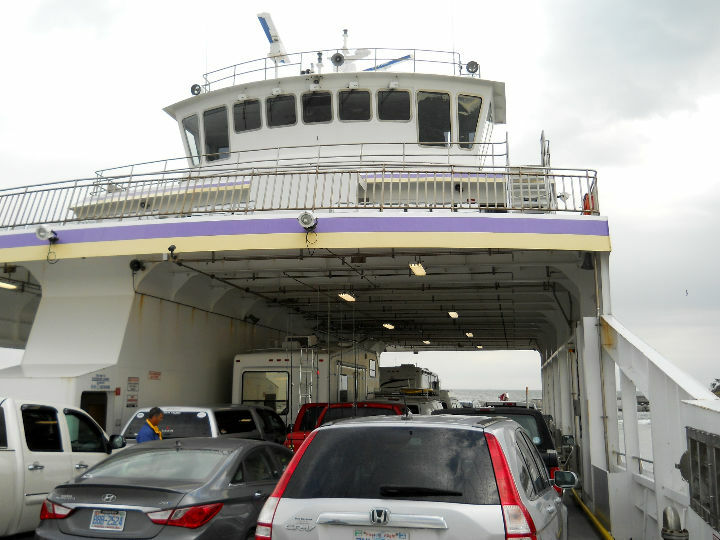 < Cedar Island Ferry ride. [Saturday] Today was a driving day. We left Wilmington around 9 AM and traveled US-74, IH-95 and IH-20 to Madison, GA. We arrived around 5:30 and stayed one night at Country Boy's RV Park. [Sunday] Today after breakfast, we pulled the trailer into the Atlanta area via IH-20 and to the Stone Mountain Campground. 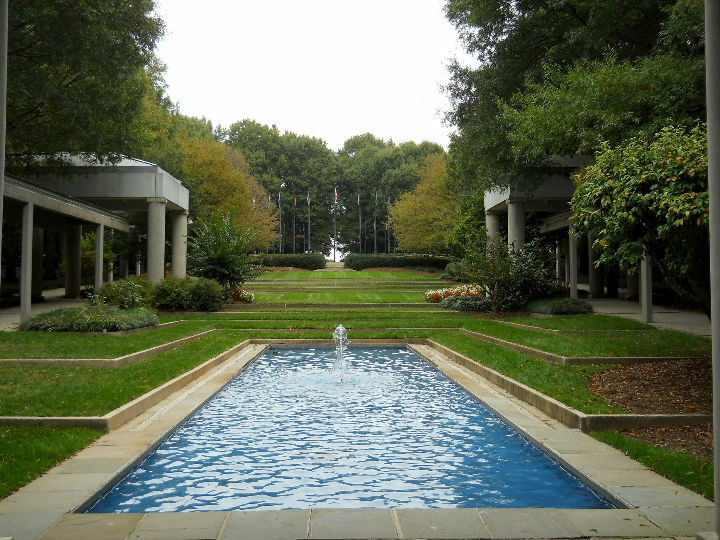 After setting up in site #331 and eating lunch, we drove into downtown Atlanta and toured the Carter Center. 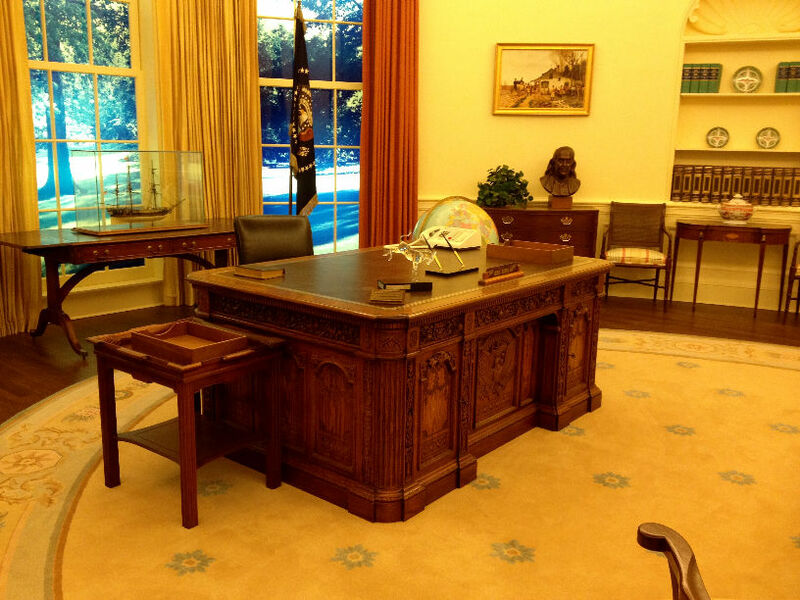 Afterwards, we drove to the CNN, World of Coke and Centenniel Park area and became somewhat acquainted with the area so we could visit them tomorrow. On the way to the trailer, we drove the road that circles Stone Mountain, before returning to the trailer. < < Stone Mountain Georgia. 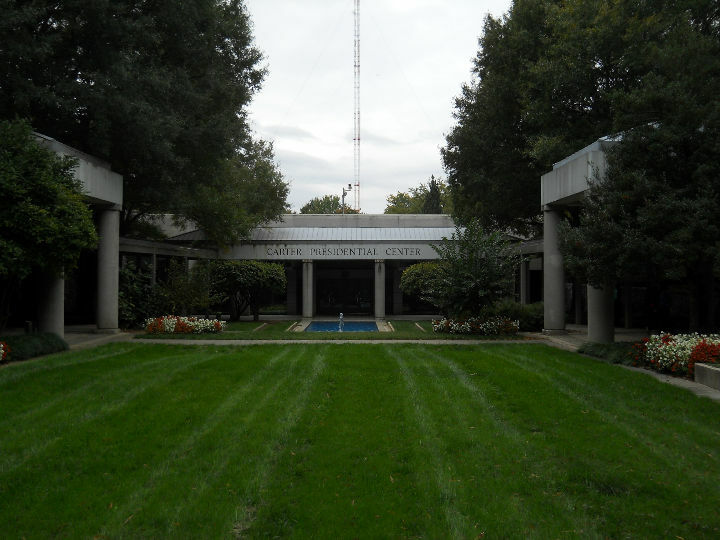 < < < Carter Center. [Monday] We spent the entire day today in Downtown Atlanta. We left the trailer about 9 AM and made good time into the downtown. 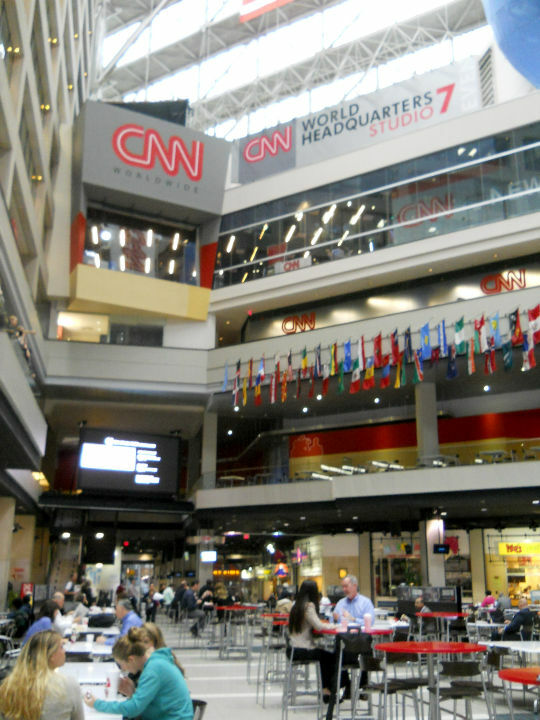 We started with the Inside CNN tour at the CNN World Headquarters. The tour was about 1 hour long and provided a good view of the network. Afterwards, we ate lunch in their Food Court. 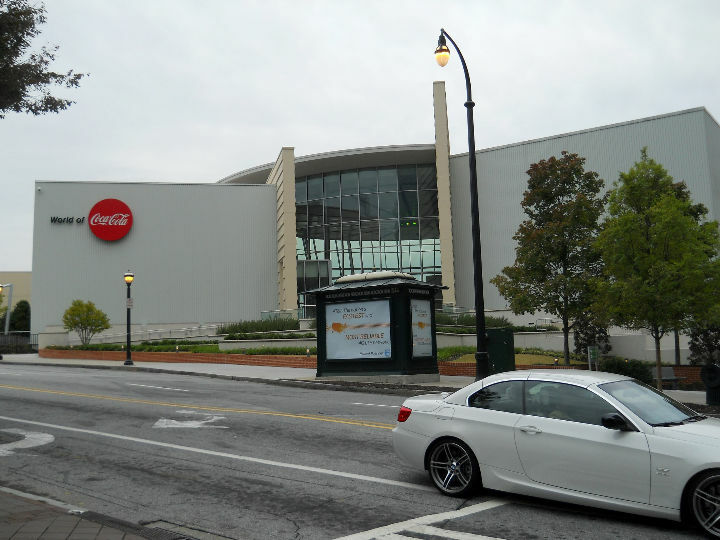 We then walked over to the World of Coca-Cola, which is across Centennial Park from CNN. This, of course, is a big advertisement for Coca-Cola products. Some portions were interesting, especially being able to taste various products they sell only in other countries around the world. Help yourself to all you want - bathrooms are handy! 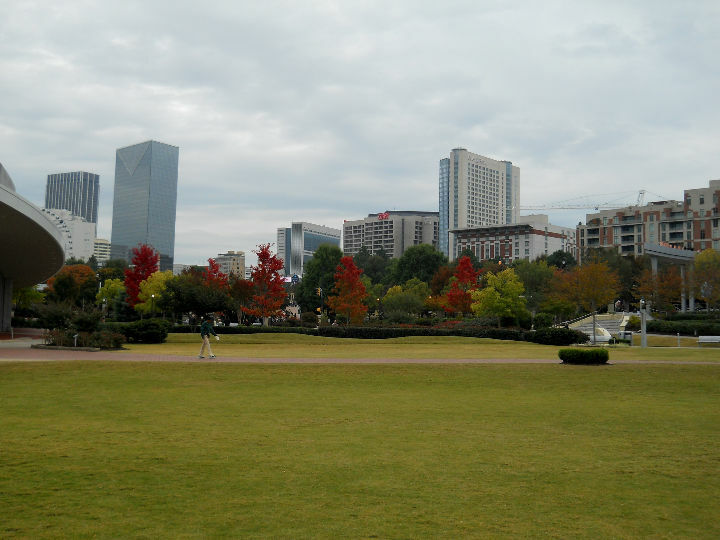 After our tour, we walked back through the Centennial Square to the closest MARTA terminal. After getting some help from a young lady, we purchased our breeze cards and 1 day fare. We then rode the blue line to 5 points and the red line from one end at the Atlanta Airport to the other and back. 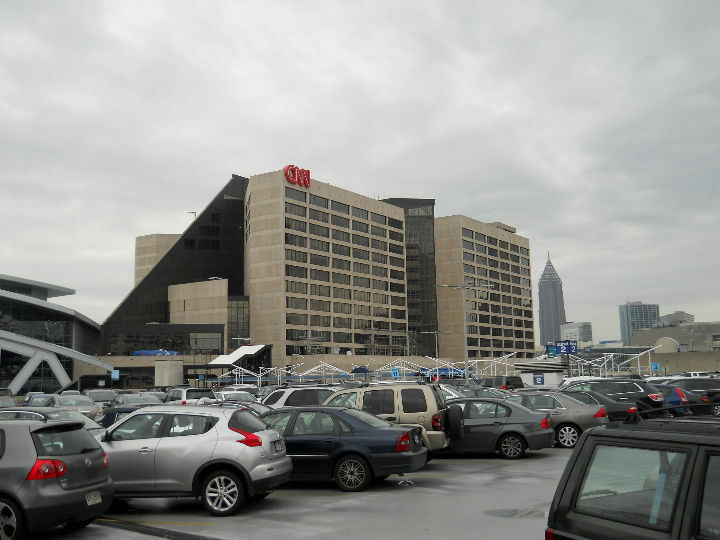 We capped off the day in Atlanta back at the CNN Food Court at Duncan Donuts for coffee and a good donut. Then back to the trailer. 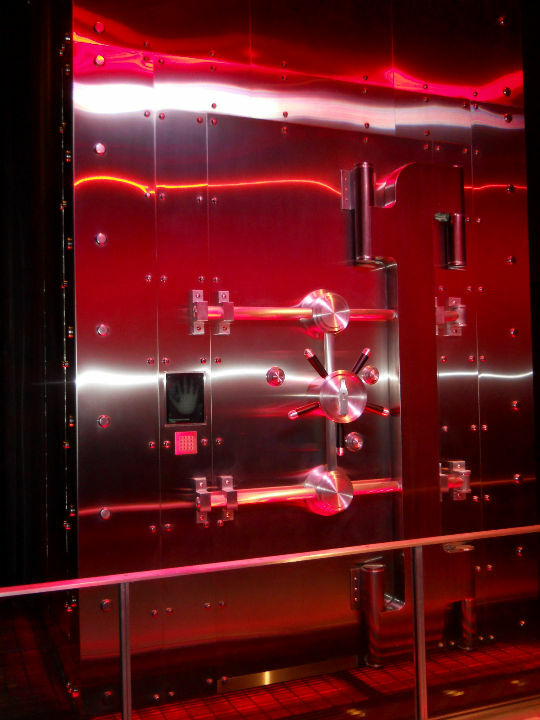 < < World of Coca-Cola tour. [Tuesday] Today, we awoke at 4:30 AM and left our campground at 5:00 AM, to beat the Atlanta traffic, and traveled south on IH-85, IH-65 and IH-10, through Montgomery, AL and Mobile, AL to Slidell, LA, where we checked into site #5 at Pine Crest RV Park around 4:30 PM. A long hard day of driving, with a time zone change along the way. [Wednesday] After breakfast, we left Slidell via IH-12 and IH-10 headed west toward Houston. As we neared Houston we picked up some light rain, but the trip through Houston rush-hour traffic was uneventful. We arrive back home in Richmond by about 6 PM. This draws to a close our vacation to North Carolina. We hope you enjoyed the photos and brief descriptions of our activities. 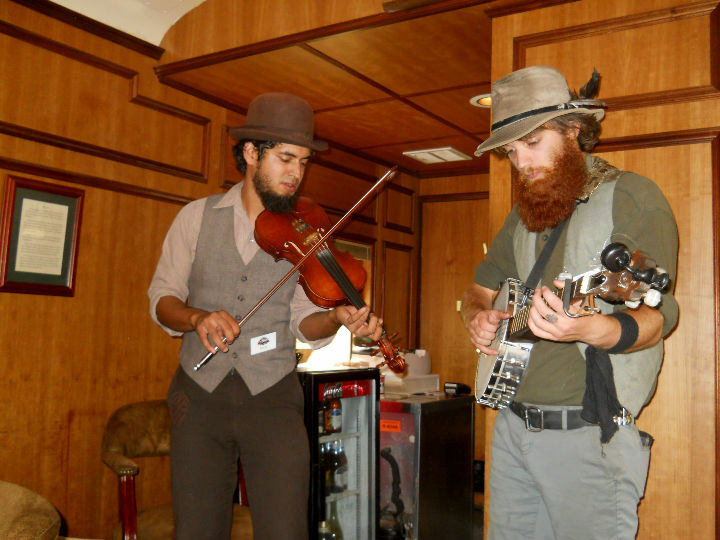 God willing, join us again soon for another RV adventure.